The All Progressives Congress (APC) has reacted to a recent claim by the Coalition of United Political Parties (CUPP) that the Muhammadu Buhari government was planning a forceful change of leadership at the National Assembly. Imo Ugochinyere, CUPP’s spokesperson, on Tuesday, alleged that the government was set to file a suit to get an exparte order directing that one-third of the Senators/House members should open either chambers of the National Assembly. A statement he signed said CUPP was informed that the plot also included the police inviting the leadership of the National Assembly before the “controversial ruling” and detaining presiding officers to pave way for the unlawful change. “Some of the security agencies will provide security cover for the coupists while a section of the media has been co-opted to churn out news and justification for such evil plots”, he claimed. Reacting, APC national publicity secretary, Yekini Nabena, said such crude practices were rejected templates of the opposition Peoples Democratic Party (PDP), which the CUPP represents. 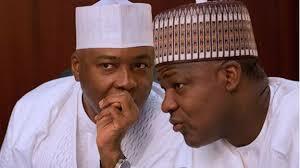 He wrote, “We consider these new rounds of falsehood by the sponsored “Coalition” as a last-ditch attempt by the outgoing and minority National Assembly leadership of the Senate President, Dr. Bukola Saraki; his Deputy, Ike Ekweremadu and Speaker, House of Representatives, Yakubu Dogara to prevent the reconvening of the National Assembly and continue a minority-rule in an APC-dominated federal legislature.